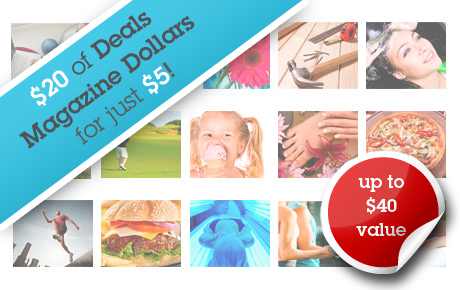 Hide deals from seller "Deals Magazine"
Hide deals from category "1. Shopping"
Deal Dollars credited to your account after purchase. Good toward any deal on Deals Magazine. Not valid toward the purchase of Brand Name Gift Card deals including but not limited to Starbucks, AMC, Barnes & Noble, Lowe's, Steak and Shake and CITGO. Stop going out of your way for 50% off or better deals. Deals Magazine has mapping technology that allows you to map the areas they most frequently visit, down to the street level. Enjoy this upgraded approach to online deals even more, when you pay $5 and get a $20 account credit (worth $40). 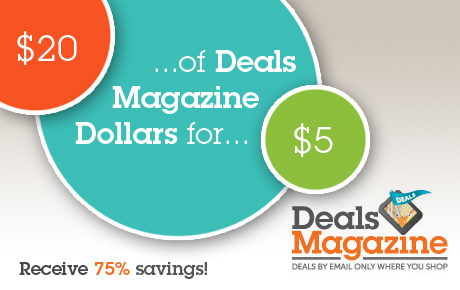 With $20 credited to your Deals Magazine account, you'll be able to select from thousands of Deals Magazine deals. If you choose a Big Deal, one that is 50% off or better, you can turn that $20 into $40 or more. Before you do, customize your shopping area to get deals in your most-frequented areas. Also, make sure to check out Deals Magazine's keyword-based deal search engine to search for deals on demand. Sending superior deals on products and services to subscribers only in their customized, street-level shopping areas. Credit will be posted to account within 1-2 business days. Visit the My Account section to view credit.